Nvidia (NVDA) is set to report Q1 earnings tonight after the close with a conference call to follow at 5pm ET. NVDA reported Q4 results at 4:20pm. Current Capital IQ consensus stands at EPS of $0.81 on Revenues of $1.909 bln. NVDA was the best performing stock in Fiscal 2016. 2017 has been a different story as it is flat (Opened the year at 104.40) in its YTD performance. Concerns over a slow down in the gaming and PC industries and tough comps have been a key factor in the stock under performing the market this year. Valuation has been concern for investors but at 26x earnings the valuation is not too crazy relatively. AMD at the time of its report was trading at 50x Forward P/E (Currently 38x). 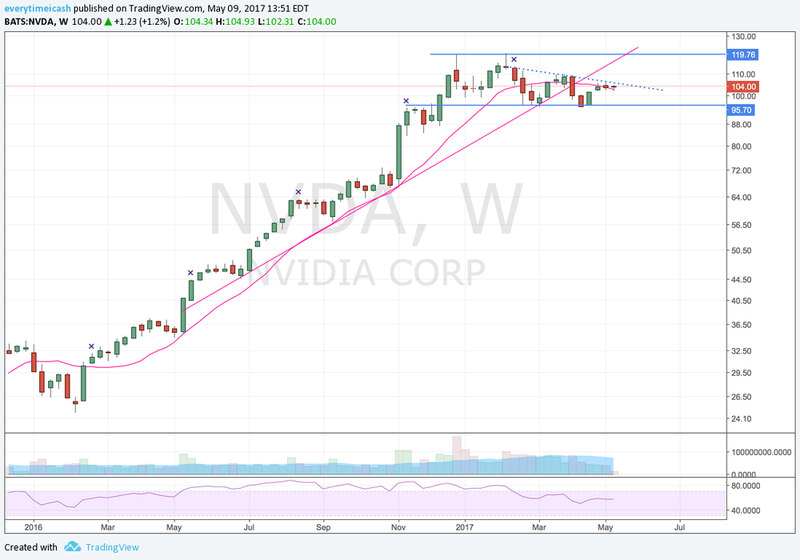 NVDA reported Q4 (Jan) earnings of $1.13 per share, $0.15 better than the Capital IQ Consensus of $0.98. Revenues rose 54.9% year/year to $2.17 bln vs the $2.1 bln Capital IQ Consensus. Non-GAAP gross margin at 60.2 percent. LOOK FOR ANY MOVE IN THE AFTERMARKET TO BE EXASPERATED BY THIS CONFERENCE TOMORROW. Going into the report options players have a call spread in the name from the looks of it. Reports Q1 (Apr) earnings of $0.85 per share, excluding non-recurring items, $0.04 better than the Capital IQ Consensus of $0.81; revenues rose 48.7% year/year to $1.94 bln vs the $1.91 bln Capital IQ Consensus. Co issues upside guidance for Q2, sees Q2 revs of $1.95 bln +/-2% (~$1.911-1.989 bln) vs. $1.9 bln Capital IQ Consensus Estimate. GAAP and non-GAAP gross margins are expected to be 58.4 percent and 58.6 percent, respectively, plus or minus 50 basis points. Capital expenditures are expected to be approximately $55 million to $65 million.